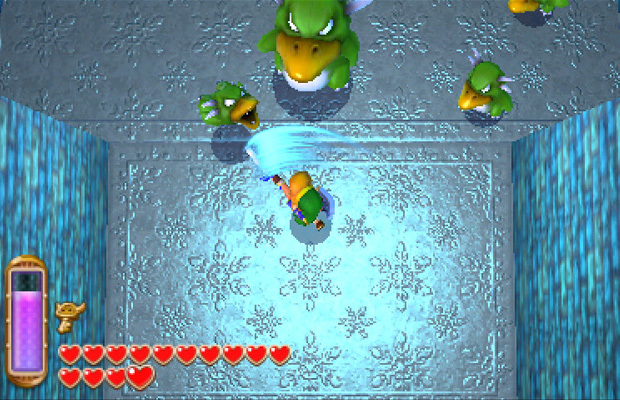 A Link Between Worlds has been refreshed to meet modern gameplay standards. This time around you can aim diagonally with current weapons such as the bow and hookshot. Adjusting to the aimiimg mechanics is pretty easy and makes using the weapons easier since they will be the main factor when solving puzzles. Prepare to travel between two worlds: Hyrule and Lorule. You’ll encounter some familiar enemies, along with new ones. If you played any Zelda game before, you know the only way to obtain other weapons was by solving puzzles in dungeons. Not anymore, as Ravio now rents out the weapons, but if you die, all rented artillery will be taken from you. Progress further in the game and you will be able to buy and keep them. 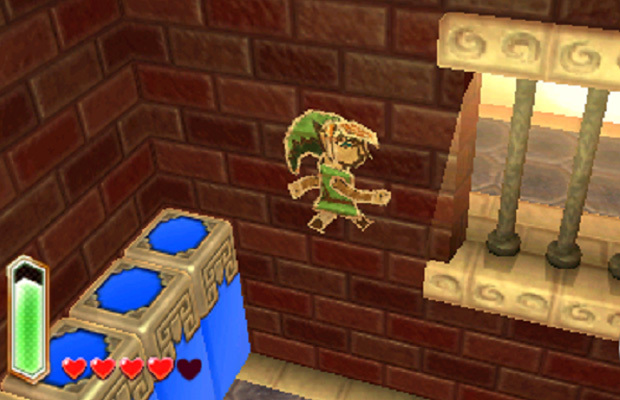 Link now has the ability to merge into walls, which only occurs when a current event comes into play. Upon receiving the power, Link will be able to travel across areas he couldn’t before—cliffs, gaps, etc.—to reach safer grounds, but only when prompt to. The meter bar is another addition to the series, used in conjunction with the weapons borrowed or purchased. Instead of running out of secondary weapons like bombs, the new system doesn’t work off a set number of items and provides ammo based on the meter being filled. An empty meter means you gotta wait to be replenished. The same applies with wall merging.